prolongued rain-weathering of the solid-block lionine Sphinx statue at the foot of the Giza Pyramid #2 (aka the Great Pyramid) suggests that it was looking up at the sky when the last Age of Leo was around i.e. 10,000 BC. 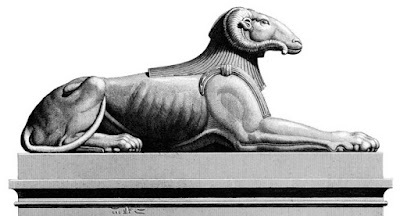 The Sphinx has been regularly repaired and amended throughout Egyptian history. Many many facelifts and restructurings and reworkings that reflects the egomaniacal desires and wishes of the Pharoahs of Egypt. 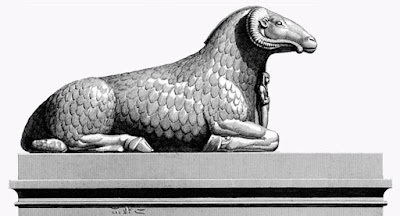 But what if the Sphinx was originally a RAM? looks nothing like the Sphinx, right? But think about it, "Most statues of lions from ancient Egypt are lions not-recumbent i.e. they are lions that are sat up, on their haunches." You can do the research if you want. I did, and it's what I found. I also found this very interesting Alternative Ram-headed Statue of Amun and would you look at the pose it's adopting, even the resting angle of the tail, looks very much like the pose of the Sphinx to me.